Last night, guests gathered at Lincoln Center for the New York City Ballet's 2014 Fall Gala, to celebrate an extraordinary collaboration between the fashion world and the dance world. Members of the world premiere ballets, including Justin Peck and Liam Scarlett, collaborated with iconic fashion designers including Carolina Herrera and Sarah Burton (Creative Director of Alexander McQueen), to bring fashion to the ballet's costume design. 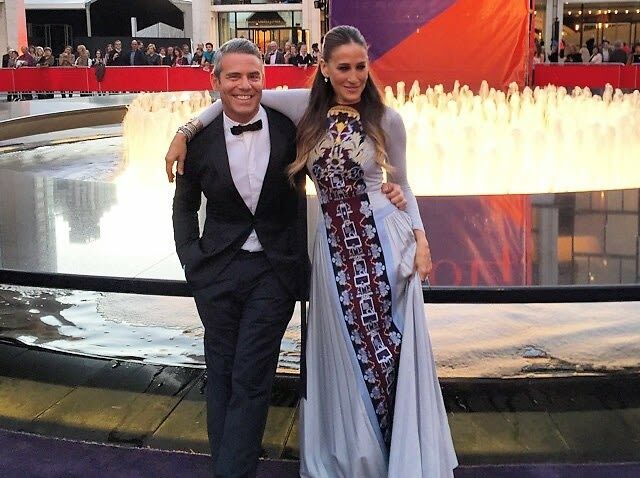 Bravo TV's Andy Cohen and Sarah Jessica Parker were snapped outside of Lincoln Center, playfully engaging with one another for the paparazzi. Who was there: Guests included Sarah Jessica Parker, Cindy Chow, Andy Cohen, Chiu-Ti Jansen, Alicia Quarles, Arden Wohl, B. Michael, Jenny Laird, Trey Laird, Andrei Kirilenko, Charles Askegard, Fe Fendi, Jon Tisch, Lizzie Tisch, Masha Kirilenko, and Wendi Deng Murdoch.